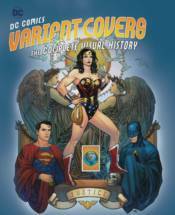 HOME > DC COMICS VARIANT COVERS: COMPLETE VISUAL HISTORY - CHO PX ED. DC COMICS VARIANT COVERS: COMPLETE VISUAL HISTORY - CHO PX ED. A PREVIEWS Exclusive! For the first time ever, explore the complete visual history of DC Comics variant comic book covers in this amazing collection, with an exclusive cover art by Frank Cho. DC Comics cover art is some of the most celebrated in the world, from the first appearance of Superman in Action Comics #1 to the iconic covers that adorn classics such as Batman: The Killing Joke and Watchmen. Now you can explore the world of these alternative works of art with DC Comics Variant Covers: The Complete Visual History, which showcases some of the finest and most famous variant covers ever produced, with insight into the design process from leading comic artists and industry experts. Featuring an astounding collection of covers featuring DC Comics' remarkable characters, DC Comics Variant Covers: The Complete Visual History is the perfect gift for casual fans and comic book aficionados alike. Featured artists include Jock, Adam Hughes, Jim Lee, Alex Ross, Frank Miller, Neal Adams, Darwyn Cooke, Dave Johnson, Mike Allred, Dan Panosian, and Brian Bolland.